With its delicate flavor, spinach is a nutrient-rich vegetable that you can add to a range of dishes. Include fully mature leaves or the more tender leaves of baby spinach in sandwiches, lasagna, pizza and salads. While raw spinach contains a proportionally high amount of dietary fiber, it's not typically difficult to digest. Spinach contains lutein, a carotenoid that aids with vision health and acts as a natural antioxidant to protect your body from toxins and free radicals. Lutein is absorbed by your gut and broken down by your body during the digestive process. A 2008 issue of "Nutrition Research" found that lutein availability was greatest in raw spinach. While canned spinach had the highest lutein content, the amount available was significantly decreased after it was heated. As a leafy green, raw spinach is high in cellulose, a type of insoluble dietary fiber. Cellulose is found in the cell walls of plants, where it provides the rigidity needed for structure, and is especially high in leafy greens. While a 2-cup serving of spinach has only 1.3 grams of fiber, a relatively small amount, the majority of it is insoluble. This means that it is not broken down by your digestive system and passes through your gut whole. Insoluble fiber can lead to gas and bloating if you are not used to consuming regular amounts of dietary fiber. The recommended intake is 20 to 35 grams per day, although most Americans do not meet this amount. Spinach contains oxalic acid, which can be irritating to your gut. If you regularly experience some irritation after eating spinach, it might be due to the oxalic acid content. If this is the case, choose baby spinach in place of regular spinach, as the leaves contain less oxalic acid. Oxalic acid can also interfere with the absorption of certain minerals, such as calcium, in your diet. Pursuing a healthy diet and thorough chewing or blending of raw spinach will reduce the irritation you experience from oxalic acid. 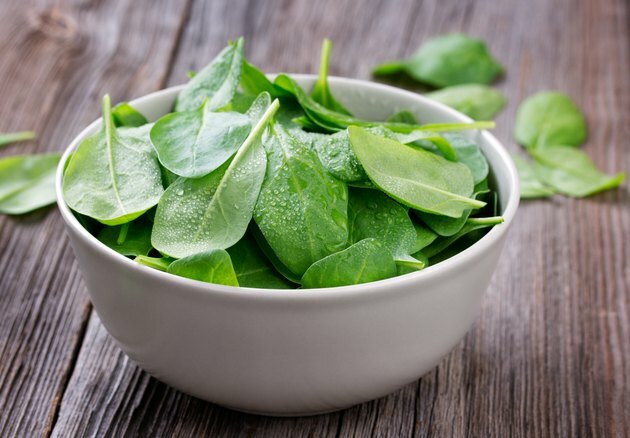 If you have trouble digesting raw spinach, lightly steam it to preserve as many heat-sensitive and water-soluble vitamins as possible, while making it easier to digest. Lightly cooking vegetables softens dietary fiber, making it easier for your body to process. Gently steaming spinach may also lower the oxalic level.